My first experience migrating a large number of applications to the cloud in one shot came when I was the CIO of Dow Jones in 2013. We had implemented a few new projects on the cloud and established some foundational cloud capabilities through our DevOps team when we became aware that the data center colocation facility we used to host our Asia-Pacific operations in Hong Kong was about to be torn down. We had 2 months to find a new home for our dozens of applications running there. We were pleasantly surprised when we were able to complete this migration in 6 weeks without having to outlay capital on new hardware or change much of our operational procedures. We found that the AWS Marketplace offered us the opportunity to lease the same load balancer and WAN accelerator we were using in our facility, and that by simply lift-and-shifting our existing databases and applications (this was the first time we didn’t rebuild systems from scratch while we migrated), our ongoing operational costs decreased by nearly 40%. This experience led to a business case to save or reallocate more than $100 million in costs across all of News Corp (our parent company) by migrating 75% of our applications to the cloud as we consolidated 56 data centers into 6. While News Corp continues its Journey toward 75%, it was able to realize its savings target in about 2 years. I’ve now been in my current role as the Head of Enterprise Strategy for AWS for just over 2 years, and I’ve had the opportunity to talk to hundreds of enterprises that are contemplating migrating large portions of their legacy IT estate to the cloud. As the demand for legacy migrations to the cloud grows, so has the collective industry experience, and my colleagues at AWS have continued to become more deliberate in how they channel this experience to help more enterprises migrate. This post is the first of a three-part mini-series outlining some of the things we’ve learned so far. What Is a Mass Migration to the Cloud? mi·gra·tion /mīˈɡrāSH(ə)n/: noun: movement of one part of something to another. People have been taking advantage of the advances in technology to migrate systems to more capable platforms since the beginning of time. Hand-written books to the printing press; self-generated electricity to the power grid; human-computed encryption/decryption to the digital computer; mainframes to commodity hardware to virtualization; and so on. The fundamental process around migration — understand the benefits of the new system, assess gaps in the existing system, plan, and migrate — hasn’t changed much over time. I have found, however, that the prospect of migrating a large number of legacy applications to the cloud can sometimes be intimidating to organizations because of the sheer magnitude of change required. Modern enterprises have IT environments that become larger and more complex every day, and organizations rarely have the opportunity to retire technical debt as they continue to build new systems. For the purposes of this mini-series, we’ll consider a mass migration to be the movement of a meaningful portion of your organization’s existing IT assets to the cloud, and we’ll simply refer to it as a “migration.” A migration might consist of a data center, a collection of data centers, a business unit, or some other portfolio of systems that is larger than a single application. Combining what we know about technology migrations with our experience helping organizations migrate their IT portfolios to AWS, we’ve developed two mental models that many of our customers have found useful in approaching mass migrations to the cloud. The first mental model illustrates the pattern we’ve seen several migrations follow. This 5-phased “Migration Process” might help you approach a migration of tens or hundreds, or even thousands, of applications. 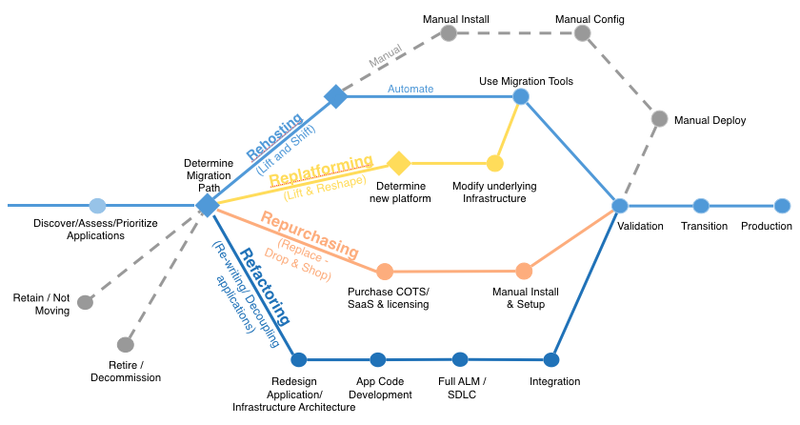 The second mental model, which I sometimes call “The 6 R’s,” offers 6 different strategies for migrating individual applications to the cloud. These mental models — while based on experience — are intended to serve as guiding principles to help you approach your migration. They are not hard-and-fast rules. Every organization has its own unique blend of constraints, budget issues, politics, culture, and market pressures that will guide its decision-making process along the way. As I mentioned above, the cloud migration process generally consists of 5 phases: Opportunity Evaluation, Portfolio Discovery and Planning, Application Design, Migration & Validation, and Operate. While there’s no perfect path or process for every migration, we’ve found that this mental model helps customers approach their migration, and it has allowed us (AWS) to codify the best practices, tools, and partners that organizations are using to migrate. For an in-depth view into this “Migration Process,” see the second post in this series, A Process for Mass Migrations to the Cloud. For a more detailed explanation of each of these 6 application migration strategies, see the third post in this series, 6 Strategies for Migrating Applications to the Cloud. Are You Ready for a Mass Migration? Mass migrations typically require an organization-wide effort and are most commonly embarked upon by organizations that have some experience with the cloud. I elaborated on the activities I typically see organizations engage in before they execute mass migrations in my posts on Getting Started with the Cloud?and 4 Foundational Investments for Your Cloud Journey, although I’m finding that, as the cloud market matures and there are more success stories to draw from, more executives are contemplating mass migrations earlier in their Journey. If you have a compelling reason to launch a migration without the benefit of existing experience, you should absolutely start to consider your business case, but I would strongly encourage you to front load the migration project with some of the activities outlined in these initial stages. An E-Book of Cloud Best Practices for Your Enterprise. 21 Best Practices for Your Cloud Migration by Sadegh Nadimi, a migration specialist from the AWS Professional Services team. A View from the Trenches by Chris Wegmann, Managing Director of the Accenture AWS Business Group. What’s your migration experience been? I’d love to hear about it, and host it on my blog! Note: “Migration” is the third of four “Stages of Adoption” I’m writing about in the Journey to Cloud-First series. The first stage is “Project,” The second stage is “Foundation.” After “Migration” comes “Reinvention.” This series follows the best practices I’ve outlined in An E-Book of Cloud Best Practices for Your Enterprise. Stay tuned for more stories posts covering each of these stages.